April 3, 2019: Mr. Hamdard Attends the UNIVERSAL PEACE FEDERATION, 35th Peace Diplomats Forum and Becomes Ambassador for Peace. March 28, 2019: Mr. Hamdard Attends the Cherry Blossoms Reception Hosted by H.E. the Minister of Agriculture, Forestry, and Fisheries. January 15, 2019: Mr. Hamdard Meets with Representative From Asian Development Bank. 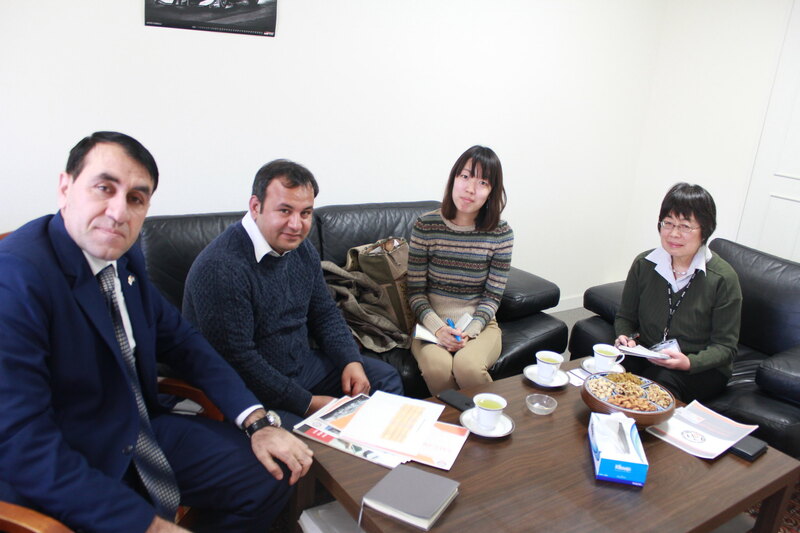 December 14, 2018: Mr. Hamdard has Meeting with Representatives from Toyota Tsusho. December 7, 2018: Mr. Hamdard Attends the Condolence Book Signing at the Embassy of the United States of America in Respect for H.E. Mr. George Herbert Walker Bush, 41st President. December 1, 2018: Mr. Hamdard participates in the Minato UNESCO Japanese Speech Contest. October 18, 2018: Mr. Hamdard, Chargé d'Affaires a.i., Attends the Welcome Reception of the Japanese Language Program for Foreign-service Officers and Public Officials. October 16, 2018: Mr. Hamdard, Chargé d'Affaires a.i., Attends the 2018 Presentation Ceremony for the Japan Foundation Awards. October 10, 2018: Dr. Azimi attends the 5th Annual Innovation for Cool Earth Forum at Hotel Chinzanso. October 5, 2018: First Secretary and Consul Mr. Hamdard Attends the Condolence Book Signing at the Embassy of the Socialist Republic of Vietnam for H.E. Mr. Do Muoi. October 1, 2018: First Secretary and Consul Mr. Hamdard Attends the Sasakawa Peace Foundation Lecture “US-Japan Relations in a Changing Asia” by Mr. Richard Fontaine. September 15, 2018: Mr. Agah Attends the Kobe Institute of Computing Graduation Ceremony. September 12, 2018: First Secretary & Consul Mr. Hamdard Attends the 27th Anniversary of the Independence of the Republic of Uzbekistan. July 20, 2018: Mr. Agah Attends a Meeting at the UNU Institute for the Advanced Study of Sustainability. July 19, 2018: Mr. Hamdard attends Inauguration Celebration for Tokyo’s Metropolitan Assembly’s Chairman Mr. Ozaki Daisuke. July 10, 2018: Meeting with Hon. Dr. David M. Malone, Rector of UN University. July 06, 2018: Mr. Hamdard attends JIIA Symposium on "Looking Back at Asia in the 20th Century from the Perspectives of International Relations and State-Building" at the International House of Japan. July 06, 2018: Mr. Azimi joined "Tour for Embassies" organized by UNIDO: "Company Visit to Daimler in Japan". June 30, 2018: Mr. Agah Attends the 10th Anniversary of the Japan Tournament FISB Speedball World Club Championship 2018. June 23, 2018: Dr. Azimi joined the Music Performance of the Resonanz Children's Choir and Angklung Ensemble of SMA 3 High School of Bandung to celebrate the 60th Anniversary of the Indonesia-Japan Diplomatic Relations. 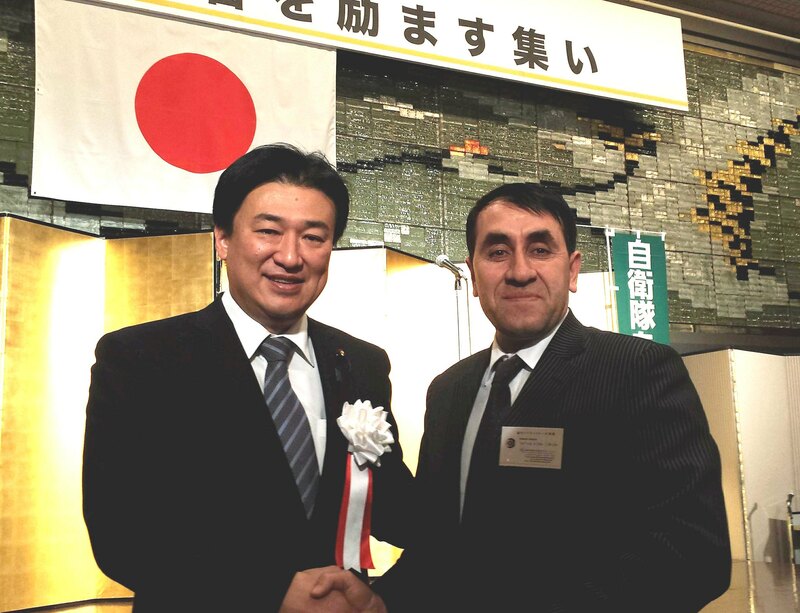 June 22, 2018: Dr. Azimi Attends the 25th Annual Convention and Reception of the Japan Nut Association. June 22, 2018: Mr. Hamdard meets Mr. Yoichi Arai, Ms. Chieko Ito, and Mr. Ryosuke Ando of the 2020 Olympic Committee at the Embassy. June 21, 2018: Dr. Azimi & Mr. Akbari join the Regional Promotion Seminar of the 2018 fiscal year organised by Japan’s Ministry of Foreign Affairs and local, Japanese governments at the Hotel Chinzanso Tokyo. June 19, 2018: Mr. Hamdard joins exchange party at the Japan International Science and Technology Center (JISTEC) at Tokyo Green Palace. June 18, 2018: First Secretary of the Embassy joins the Opening Ceremony and Preview of "Gordon Matta-Clark: Mutation in Space\" at the National Museum of Modern Art in Tokyo. June 15, 2018: Dr. Azimi visits Higashimachi Elementary School for Open Day. June 14, 2018: Mr. Hamdard visits the Meiji Jingu Iris Garden including the Special Iris Viewing at Meiji Jingu in Yoyogi (Shibuya), Tokyo. June 14, 2018: Mr Hamdard meets with H.E. Mr. Hiroshi Oka, Director-General & Ambassador of Middle Eastern and African Affairs Bureau & Special Representative to Afghanistan & Pakistan Assistance at MOFA. June 13, 2018: Dr. Azimi attends Saint-Saens Serenade Champagne Concert with audience and artists’ reception conducted by Mr. Robert Rykes and the Tokyo Sinfonia string orchestra at Hakuju Hall in Tokyo. June 12 & 13, 2018: Dr. Azimi attends two-day long Asian Development Bank Institute’s Workshop on Labor Income Share in Asia: “Conceptual Issues, Drivers, and Policy Implications” on June 12th& June 13th at the Asian Development Bank Institute in Tokyo. June 08, 2018: Mr. Agah attends at the United Nations University’s headquarters in Tokyo the Conversation Series about “Beyond Countries and Conflicts: Civilians Countering Extremism in Africa” with Ms. Alexis Okeowo & Ms. Hillary McBride. June 06, 2018: Mr. Hamdard attends Yomiuri International Forum 2018 about “The Abe-Trump Alliance & North Korea” at the Imperial Hotel Tokyo with his Excellency Ambassador Dr. Mohabbat. June 05, 2018: Mr. Agah attends the First Working Level Meeting of Minato City with several Embassies and other Institutions in Minato, Tokyo. June 05, 2018: Mr. Hamdard joins the United Nations University’s Conversation Series about Human Rights with Assistant Secretary-General for Human Rights Andrew Gilmour, Tokyo. May 9, 2018: Mr. Hamdard attends Ms. Makiyama's Lecture about the Future of Japan. May 9, 2018: Mr. Hamdard Attends the Condolence Book Signing at the Embassy of the Republic of Guatemala. April 24, 2018: Mr. Hamdard Attends the Luncheon Hosted by Director of Human Rights and Humanitarian Affairs Division of MOFA Japan. April 21, 2018: Mr. Hamdard Attends the 21st Japanese Speech Contest for Foreign Diplomats in Japan. April 20, 2018: Mr. Hamdard Attends the Condolence Book Signing at the Embassy of the Republic of South Africa. April 18, 2018: Mr. Ghafoori Attends the Condolence Book Signing at the Embassy of the Republic of Ecuador. April 16, 2018: Mr. Hamdard Attends the Condolence Book Signing at the Embassy of the Republic of Algeria. April 12, 2018: Mr. Ghafoori Attends the Condolence Book Signing for the Death of Mama Nomzamo Winnie Madikizela-Mandela at the South African Embassy in Japan. March 29, 2018: Mr. Ghafoori Attends the Condolence Book Signing at the Embassy of the Russian Federation for the Tragic Kemerovo Fire. March 13, 2018: Mr. Hamdard attends a Reception hosted for Mr. Hiroyuki Moriyama. December 20, 2017: Mr. Hamdard attends Hon. MP Kihara’s Reception. December 13, 2017: Mr. Hamdard Meets with Mr. Arabzai, CEO of Core Drillers. November 21, 2017: Mr. Hamdard Attends Mr. Minoru Kiuchi’s Reception for the Diplomatic Community. November 20, 2017: Introduction Party of the New President of the Middle East Institute of Japan Saiki. November 20, 2017: Mr. Ghafoori attends the Fujinokuni (Home of Mt. Fuji) Reception. November 13, 2017: Mr. Ghafoori attends a meeting with the Consulate General of the Republic of Philippines. October 26, 2017: Mr. Akbari Attends the Opening Ceremony of the Science Centre World Summit 2017 at the National Museum of Emerging Science and Innovation. October 26, 2017: Mr. Ghafoori Attends the 94th Proclamation of the Republic of Turkey. October 21, 2017: Mr. Hamdard Attends the 94th Proclamation of the Republic of Turkey. October 18, 2017: Mr. Hamdard Attendance at the Yomiuri International Forum. October 17, 2017: Mr. Ghafoori Attends Reception Hosted by Deputy Chief of Mission for the Embassy of the United States of America. October 17, 2017: Mr. Ghafoori Attends Condolence Book Signing for H.E. Mr. Armando Calderón Sol, former President of the Republic of El Salvador. October 15, 2017: Mr. Hamdard Attendance at the HJ Peace Loving Festival KANAGAWA. October 12, 2017: Dinner at the Residence of the Minister of the Consular Section at the Embassy of India. September 16, 2017: Mr. Agah Attendance at KIC Graduation Ceremony. September 12, 2017: Mr. Ghafoori Meeting with Tokyo Immigration Officials. September 11, 2017: Mr. Hamdard Courtesy Call on H.E. Ambassador of Denmark. September 11, 2017: Mr. Ghafoori and Mr. Hamdard Courtesy Call on New Minister of the Embassy of Japan in Afghanistan. September 8, 2017: Mr. Ghafoori Farewell Dinner for H.E. Ambassador of Turkey. September 7, 2017: Opening of the Afghan Photo Exhibition in Collaboration with Minato City. September 6, 2017: Mr. Hamdard Courtesy Call on H.E. Ambassador of Singapore. September 5, 2017: Mr. Agah Courtesy Call on Hon. Mr. Shinichi Kitaoka, President of JICA. September 4, 2017: Mr. Hamdard Courtesy Call on Hon. Mr. Isao Iijima. August 29, 2017: Mr. Ghafoori Condolence Book Signing at Embassy of the Marshall Islands. August 22, 2017: Mr. Hamdard’s TICAD Briefing. August 10, 2017: Mr. Hamdard meets with Mrs. Khadija Al-Salman. August 9, 2017: Mr. Hamdard attends the press briefing on nuclear terrorism countermeasure at the Foreign Press Center. August 8, 2017: Mr. Hamdard Attends Dr. Seyed Abbas Araghchi’s Lecture. August 3, 2017: Mr. Ghafoori attends the National Day Reception of Bolivia. August 2, 2017: Mr. Ghafoori attends the 15th Anniversary of the ICC hosted at Dutch Embassy. August 2, 2017: Mr. Ghafoori attends Okayama Prefecture's Promotional Fair. August 2, 2017: Mr. Hamdard's Meeting with Mr. Nazarov. July 26, 2017: Top Students of Kanagawa Prefectural Yokohama Suiran High School’s International Understanding Department Visits the Embassy. July 25, 2017: Meeting with Image Oneworld Kimono Project. July 13, 2017: Mr. Ghafoori Attends the 30th Peace Diplomats Forum. July 6, 2017: Mr. Ghafoori Attended the Reception in Celebration of the 241st Anniversary of American Independence at the US Ambassador’s Residence. July 3, 2017: Mr. Ghafoori Attended the Special Exhibition, “Thailand: Brilliant Land of the Buddha”.